This fall has been beautiful. We have had clear, sunny days along with warm temperatures. Except for the sun setting earlier, it seemed like this fall was an extension of summer. Until, of course, the weekend that we were expecting guests. Every fall, my dad’s extended family gets together somewhere. I use that broad term, “somewhere,” because we are scattered all over the country. One year, the family met on the East Coast. The next year, they went to the West Coast. This year, it was time to visit the Midwest. And of course, the temperatures dropped into the sixties and the rain came. Fortunately, the only thing my family wants to do is be together, talk and play cards, so the rain was just a little thing. When I was a little girl, we always were together on the day after Thanksgiving. My dad and my uncles were pastors, so they had to work on Thanksgiving morning. My dad would preach at church and then we would get in the car to drive to Detroit, or Ft. Wayne, or Canton, Ohio. Every few years it was our turn, so we didn’t have to travel. One of my mom’s favorite times was Thanksgiving night–the night before the big meal. All my aunts would gather in the kitchen to cook and talk. It was a lot of work to feed all us children; when my little sister was born, that made twenty cousins in all. Our parents had no money to stay in hotels, so we slept on the floor in our cousins’ rooms, in the basement, even once in the church next door. On Friday came the big turkey feast! It was a day late, but it was still Thanksgiving to us. Many years later, Thanksgiving became complicated. Cousins got married and had children, and there were more and more obligations to fulfill. Now, we have “Pre-Thanksgiving.” It’s like Thanksgiving, but it’s not. The cousins can afford to stay at a hotel and the kids don’t have to sleep on the floor. There is no cooking the night before. This year, I even decided that I was not going to serve turkey. I had the dinner catered with authentic Chicago-style food; Lou Malnati’s deep dish pizza, pasta, and Italian beef. I remember being one of the little cousins and going along with a “show” that we performed for our parents a long, long time ago in a basement in Ft. Wayne. 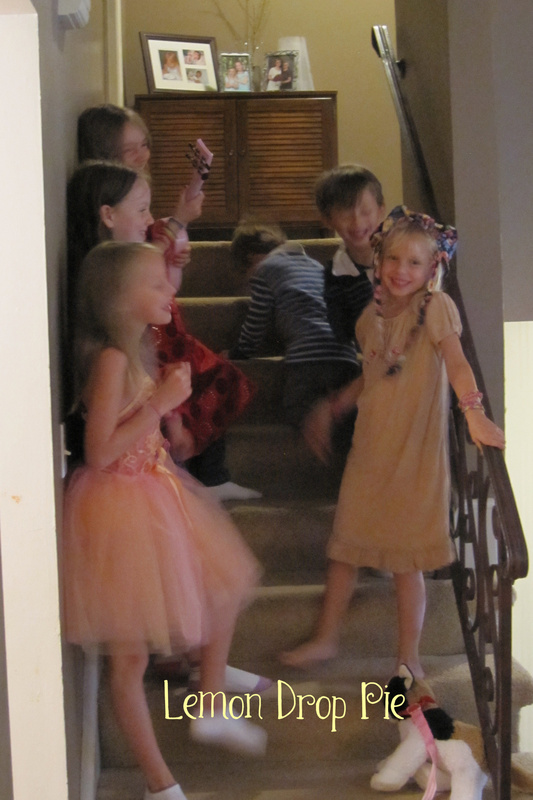 At the very beginning of the festivities his year, my daughters and my cousins’ kids put on a show of their own. They stood on the steps, plucked a toy guitar and sang their hearts out. They were making their own wonderful childhood memories. It might not have been Thanksgiving, but it was still Thanksgiving to us. We give thanks for the blessings God gave us in family; in good weather and bad, in health and in sickness, with those present and in the hearts of those absent, and we know we are loved. Oh, and did I mention this, family? While playing cards, I got the best 500 hand in my life! Ten diamonds, baby! Add your own fall link, read other fall stories, and spread the word about the Spin Cycle on Facebook and Twitter by using the hashtag #SpinCycle! Gretchen and I will reveal next week’s Spin Cycle topic on Monday. Plus, for TODAY ONLY! Download your copy of The Mother of All Meltdowns (a book I co-authored along with twenty-nine fellow bloggers) for just $0.99! Please, please, please…download today to help us get on Amazon’a best seller’s list! Thank you for your support! This makes me ache for the Thanksgivings of long ago. So much has changed. We no longer travel to the large relative gathering, in fact they don’t even do it every year. However, I’ve started hosting dinner here at my house. It’s been only my family, but I’m thinking of inviting neighbors and friends this year…it’s always more fun with a big crowd! Aunts in your kitchen, or any kitchen, must have been the best place for the family news. How amazing to have a group of women gather around talking and working together. Wish I had something like that for my girls. How did the Chicago meal turnout? We have been getting together is my husband’s family for years. As the nieces and nephews get married I think the gathering may change or be moved to another time of year. Love that the kids put on their own show! Can’t imagine having that many people in my kitchen — what wonderful memories you must make each year! How great that you had forty-one people together! Reminds me of my family’s old Christmas Eve parties. And I love the idea of a “pre-Thanksgiving.” The holidays always fill up so quickly that there’s not enough time to actually enjoy each of the events. This probably gave you more time to actually enjoy each other’s company without feeling worn out from too many parties already. I have such a big family and Thanksgiving used to be a 40 person party! At least. Anyway, this made me miss that. We’re more scattered these days but still large and loud. How fun! Even though it is tougher to gather….it sounds amazing! And I personally love those family holidays so much! Best memories are created when family gathers! Thank you so much for sharing! I loved the adorable picture! Oh Ginny, this warmed my heart! Your family always sounds like something out of a book. I can’t tell you how much I envy you your big crowd! It’s SO important and amazing that you still have these gatherings regularly – so many families don’t. It’s a tradition the girls will absolutely treasure! And…I will now have “Come Let Us Gather” stuck in my head all day! !